The party bus Brandon service that we offer helps you to find a ride that will be entertaining for your friends and family members. Even if your office team is here for work reasons, why not make the ride an enjoyable one? That can be easily done when you check out the party bus service we offer. Call now to reserve a limousine rental 813-514-6980. 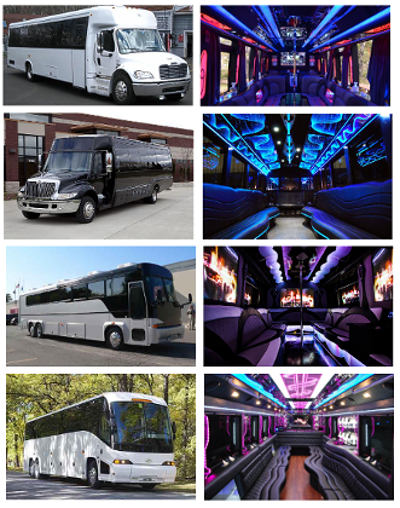 There are 20 passenger party bus models or more which can be chosen for getting a limo bus luxury ride. The rides are equipped with a music system, luxury amenities like a night club setting, helping you to enjoy a party while on the go. If you are looking around for our premier party bus rental service, you will surely not have to look any further. You will find the party bus to be exactly what you need. The process of booking our party bus service is an easy one. All you need to do is log onto our site and check out the 30 passenger party bus models and more which we have available. The process of booking is done in minutes once you have checked out the different amenities and features we offer. There are double decker or smaller coaches and luxury or standard amenities like a kitchenette, entertainment systems and more. You could also make a reservation by calling 813-514-6980. Ace Golf Ranges; this is a good place to visit for the golfers. Daydreams Spa; for a day spa facility you could stop by here. Oakfield Lanes; for an evening of bowling fun, get your friends here. The Regency 20; you can watch some live shows here. Craft Beer Cellar; your friends and you can enjoy craft beer in this place. These are some of the several places you can visit in and around Brandon. For transporting large groups of people to and fro from the nearby airports, you might face a problem with transportation. We offer our party bus rental Brandon coaches that are ideal for picking up and dropping off people at Sarasota-Bradenton international airport area. With our service you will be able to get large groups of people to the airport on time. The party bus Brandon service that we offer has several models, as many as 40 passenger party bus models to choose from. You could even opt for 50 passenger party bus vehicles when you need to transport large groups of people from Brandon to nearby places like Mango, Winston, Lakeland Highlands, Bloomingdale, Temple Terrace, Zephyrhills, Lutz, Lake Magdalene, Plant City, Oldsmar and others.